We, the media, ruined Shady's party and are deeply apologetic. 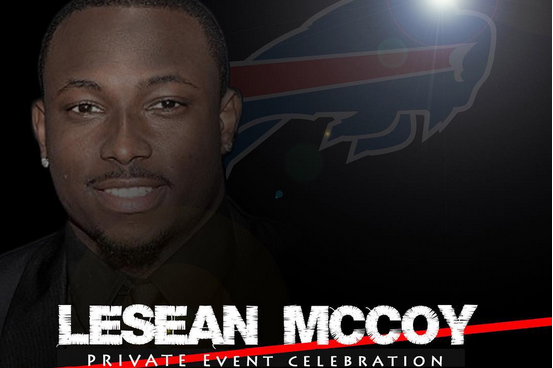 With all the talk lately of an Eagles reunion with Washington wideout DeSean Jackson, it only makes sense to check in on the life and times of LeSean McCoy up there where hell froze over, also known as Buffalo, New York. Say what you will about McCoy's legal saga and other questionable matters that have found the light of day, but the 28-year-old back is still an obvious difference-maker on the field, one of the best in the NFL in that respect. On Sunday, the Eagles' all-time leading rusher will likely surpass 1,000 yards for the fifth time in eight seasons as the 6-6 Bills cling to their playoff hopes at home against the 7-5 Pittsburgh Steelers. It's a scenario the Bills seem to play out at this exact time every single year ... and Buffalo hasn't made the playoffs since 1999, to put the Eagles' woes in perspective. The one thing McCoy did not wish to talk about heading into the weekend was that one time he wanted to throw a ladies-only private party in Philadelphia, with signed confidentiality agreements. This was the same bash our own Jimmy Kempski was "totally getting into" even though his womanliness is sorely lacking, as evidenced here. The ensuing publicity convinced McCoy to alter his plans and, more likely than not, the way he views reporters. His bummed out Instagram post says it all, although he kept a sense of humor about it at the time. On Thursday, McCoy was scheduled to take a conference call with the media in Pittsburgh, where he attended college and maintains strong ties. It did not got well, per Bills beat reporter Sal Capaccio. It is fair to point out that there were probably lots of better things to ask McCoy. What do you do in Buffalo? Are you happy with the wings at Anchor Bar? Have you considered attending the Dr. Jazz and The Jazzbugs show at Nietzche's on Sunday night, win or lose, but especially if you lose? Would you say your game is similar to LeVeon Bell's (this way you can say, no, his is similar to mine, etc.)? How is your health? At the end of the day, the reporters tweet the stories about McCoy, and McCoy tweets stuff like this.